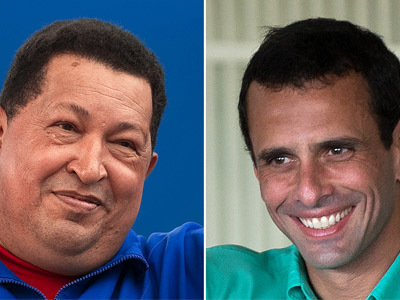 This Sunday’s elections will pit incumbent President Hugo Chávez Frías against neoliberal pro-US opposition candidate Henrique Capriles Radonski. Opinion polls vary widely both ways, proof it will be a head-to-head race. ­This election is not only of vital importance to Venezuela, but to all of Latin America, as Chávez has been a veritable barrier against traditional US interventionism in the region. ­That’s been the rallying call in the mainstream Western media, demonizing Chávez’s refusal to align Venezuela to the Western powers’ geopolitical objectives throughout the world, something the US and its allies find very hard to swallow. That’s why they’ve put all their clout behind young up-start Henrique Capriles Radonski, as if he were a savior of democracy in Venezuela. But that’s not quite the case when you consider that Capriles Radonski was very much involved in the failed US-backed coup in April 2002 to oust Chávez, and even spent a short spate in jail for it. Chávez, in turn, is presented as “authoritarian and not democratic”. And yet, when he lost the 2007 constitutional reform referendum or the 2010 congressional elections, his government fully heeded the electorate’s will. No one today doubts that Sunday’s elections will be transparent and fair. So why all the anger and fuss against Chávez? Irrespective of whether his domestic policies are good or bad, his foreign policies have held Venezuela’s sovereignty and self-esteem very high indeed, actively supporting all nations being savagely attacked by the US, UK, NATO or Israel. Such is Venezuela’s support of the martyred peoples of Palestine, Iraq, Afghanistan and Libya, all flagrantly bombed, invaded and devastated by the Western powers based on outright lies, perverted distortions of the truth, and corporate greed to grab oil resources. Today, the West targets Syria engineering internal strife and civil war as they already did in Iraq, Libya and other Muslim countries: in Orwellian Newspeak, the “Arab Spring”. They also threaten Iran with unilateral military attack and commit murder, sabotage and financial manipulation inside Iranian territory whilst spreading all sorts of global media lies. ­It must be said: at the center of the “We Hate Chavez” movement is Israel, for here lies one of the clues to the sudden rise of Capriles Radonski. Israel and the global Zionist Movement would love to greet him as Venezuela’s new president, and not just because he is Jewish on both his mother’s and father’s side – a rather surprising fact in a country of almost 30 million people, that has an extremely tiny Jewish community of 12,000 (0.03 per cent of the total population!!). The real issue lies in the fact that he would join the global support-Israel-at-any-cost movement, in line with what already occurs in the US, UK, EU, Canada, Australia, New Zealand, and even in Latin American countries like Mexico, Chile and even Argentina. Here we must pause and make sure we don’t confuse politics with religion: not all Jews are Zionists; not all Zionists are Jews, Zionism being a fundamentalist political ideology of global reach and huge political and financial clout, whose militants come from a variety of religious faiths. Fine! So, yes, Capriles Radonski is in that same camp which is why Zionist media and money are staunchly supporting him. For they will never forgive Chávez’s hosting Iranian President Mahmoud Ahmadinejad in Caracas, rendering him international political support in his fight against threats, aggression and the murder of his country’s politicians and scientists committed by CIA and Israeli Mossad assassins. They will never forgive Chavez’s support for Libya’s Muammar Gaddafi, murdered on live TV by NATO-backed thugs to the boisterous laughter of Hilary Clinton. They will never forgive Chavez’s support for the legitimate government of Syria in its fight against local and foreign terrorists financed, armed and trained by the US, Israel and UK, as openly stated by US Senator John McCain. They will never forgive Chavez’s influence in Latin America, which inspired other countries to take an independent stance towards Iran, as the cases of Bolivia, Ecuador; even Brazil and Argentina show. Clearly, Henrique Capriles Radonski is the absolute favorite of the US and its allies, and of the Zionist organizations and lobbies that reign over them. The real goal: Conquer Venezuela! 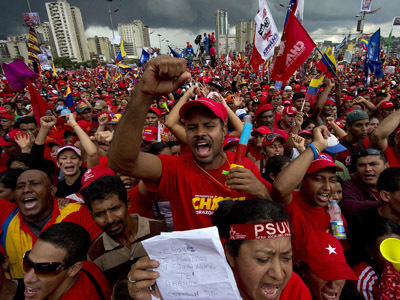 ­Whilst their very short-term goal is to defeat Hugo Chávez; the medium-term goal is to defeat Venezuela and, further ahead, their long-term goal is to defeat all of Latin America. If Venezuela falls into the hands of Capriles Radonski and the Global Power Masters supporting him, he will then join forces with Colombia, whose pro-US President Juan Manuel Santos is a member of David Rockefellers “Americas Society” and its mega bankers. He will join forces with pro-US/UK regimes as Peña Nieto’s in México and Piñera’s in Chile. A defeated Venezuela would become subordinate to the goals and objectives of the US and its partners, who are planning and starting to implement a “Latin American Spring”. Capriles Radonski would become a milestone in such a “Spring” which, like its Arab counterpart, promotes Western powers’ hegemony over the entire region, promoting “regime change” in countries not fully aligned to them, their multinational corporations’ natural resources appetites, and their mega bankers’ greed. Engineering social uprisings and civil wars is what “Democracy Made in USA” is now all about. By the way, it’s no coincidence that this long-planned on-going process is now guaranteed by the powerful US Fourth South Atlantic Fleet, which Baby Bush reactivated in 2008 after it had been scrapped almost half a century ago. Hugo Chávez understands this very well; so does Brazil, which is actively strengthening and modernizing is air and naval military forces. Only misgoverned and mismanaged countries like Argentina under Cristina Kirchner look the other way whilst all of this takes place right under their noses. But that’s the kind of regime that “Democracy Made in USA” promotes in countries like Argentina, Colombia, Mexico, Honduras and Panama. That’s the role that presidents like Kirchner, Menem, Uribe, Santos, Calderón and Zedillo are there to play: keeping their peoples ignorant and dumbed-down, throwing the ghastly masses of the poor a bone every now and then, whilst they and “friends” are all busy getting rich through corruption and embezzlement. Regarding Chavez’s health, boy oh boy how Washington, London and Tel Aviv would have loved for his cancer to take him out!! Time and again Reuters, Fox News and The New York Times practically had him dead and buried, and yet the good doctors and treatment over in Cuba brought Chávez back to health. Maybe it’s because Merck, Abbott, Glaxo and the others are NOT in Havana? Poor Cuba: yet another country under decades of attack from Big Brother to the north. Naturally, there’s still much to be done to improve social conditions in Venezuela; of course mistakes have been made, but above all Hugo Chávez has held up Venezuela’s honor and dignity and, by extension, that of Latin America as a whole, against common adversaries to the north. Lucid, awakened and honorable Venezuelans know this but, as with all countries, there is also a massive deadweight of the population that will “vote with their wallets”, only catering to their own personal interests, whilst caring little or nothing for the common good. Let’s hope a majority of Venezuelans will be inspired to vote with a strong heart and a clear mind.